Looking to create a cinematic experience in your home? Our Technicians will help you install cable and wiring for your entire audio and video system. Installing your own low-voltage in-wall wiring can be a great way to set the groundwork for a good-looking system that blends attractively into your home decor. Used primarily for TV, Satellite, and Cable Modems. 3 coaxial wires together can also be adapted to work as component or composite wires. Used as phone wire. Each pair of twisted wires handles 1 phone line. Typical Cat 3 wire contains 2 pairs of wire for 2 phone lines, but the plugs can handle 3 pair for 3 lines. Used for Internet networks. Your Cable or DSL modem will output this network wire, with Category 5 being the lowest quality and the proposed Category 7 standard the best. You need to run speaker wire for in wall/in ceiling speakers. 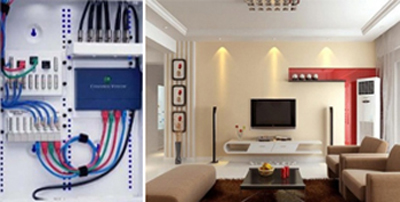 You may also run it in wall so that the wires will not be visible on the floor. Just run the wire from terminals behind your entertainment center to wall plates behind your speakers. This cable is used for both audio and video. Each composite cable contains a main conductor and a shield. Coax cable with its good shielding is the best bet for long composite cable runs. BNC cable is used in many of the same situations as Composite or Component cable. BNC offers a better quality cable (usually a shielded coax cable) with a quick twist connector that cannot fall out on its own. This is a popular video format that is quickly being replaced with DVI and HDMI. S-Video cable is actually 2 Coaxial cables in one. There are 2 signal cables (Y & C) and 2 grounds.